If you have a dog, you will probably have to deal with arthritis when he gets older. Arthritis in dogs is the most common health issue in older dogs. Just like humans, your pet´s joints will wear out and tear due to use over the years. Arthritis is, then, an inflammation of the joints. Memory Foam Dog Beds Eliminate the Pain of Arthritis in Dogs. Although arthritis in dogs is more common in older dogs, it can also happen in young ones, especially after there have been problems with bone and joint development. Bone surfaces in dogs are normally covered with joint fluid that allows them the two surfaces to glide freely against each other. This reduces friction between joints. When the cartilage within the joints changes or suffers damage, friction is increased as bones rub against each other. his causes great discomfort and pain in your dog. The constant rubbing of the bones at the joint promotes the growth of new bone, making the joint stiffer. This gradually limits the dog’s movement. This condition is known as degenerative joint disease. The cause of this damage to joint cartilage can be caused by trauma, joint instability, or abnormal cartilage development. A dog suffering arthritis will no longer be keen to exercise as they used to. The pain and stiffness will bring great discomfort to your dog. Sometimes, dogs lick profusely on the area where they hurt. Joints rarely look swollen or hot. In most cases, the signs of arthritis are hard to detect with the naked eye. Some dogs will display evident signs of pain but others will just grow slower. What should I do if my dog suffers arthritis? 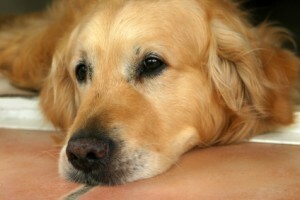 There are several things you can do to alleviate the pain caused by arthritis in dogs. Physical therapy should be specific to the needs of your dog. For starters, you should control your dog´s diet and provide enough exercise. Arthritis is more common in overweight dogs. Leash walking and mild jogging. Medical treatments for a dog suffering arthritis include cartilage protectors to reduce cartilage damage, a family of drugs known as nutraceuticals (glucosamine and chondroitin), and anti-inflammatory drugs (NSAIDs). Unfortunately, even when you can keep your dog in therapy to cope with arthritis, the condition will not go away. Once a cartilage breaks, it cannot repair itself completely. However, with the proper therapy, you can have a pain-free dog.